If you have ever attended any session where I have presented and the topic of diversity has come up, you know I am quick to tell attendees that I do not give out diverse book lists. Here is my reason why: there are no diverse texts. It is in the transaction (Rosenblatt, 1986) between the reader and the text that a text’s diversity is realized. The way we have framed the word diversity creates a binary—diverse or non-diverse. Using the word diverse to describe texts also creates a default position, because one must ask diverse for whom or diverse from what? The word diverse as it is currently used centers heteronormative whiteness as the default. We also lose sight of the big picture. Any diverse book list would have to have a variety of races, abilities, gender, etc. represented. So, if you find yourself holding a book list and notice that the creators have simply compiled a list of non-white authors, know that you are not holding a diverse book list. Meaning is revealed within context. The call for diverse texts is a response to the overwhelming underrepresentation of individuals from minoritized groups as well as the underwhelming number of publishers publishing own voices, and this is laudable. That is its context. However, allowing diversity to be framed in a binary fashion or labeling any single text as diverse stands in direct contradiction to the intended purpose of the call for diverse texts. A binary lens of diversity only further others the narratives of individuals from minoritized groups. I, much you like, have heard individuals refer to Dr. Rudine Sims-Bishops (1990) work citing the need for all readers to have access to Mirror, Window, and Sliding-glass door texts. It impossible to know which one of these roles a book will take on until it is in a reader’s hands; when it is placed back on the shelf, it has the power to take on a different role. This is the beauty of good literature—it cannot be placed into one category or relegated to the “diversity and inclusion” shelf of your library. I also question if many diverse book lists consider who is telling the story. Narratives written by individuals from non-minoritized groups about people from minoritized groups run the danger of being filled with stereotypes. My issue with book lists is not the lists themselves; it’s how the lists are used. A hammer is just a hammer until it is placed in the hands of master craftsperson. The power does not reside in the thing itself; the power is realized as the tool is used by an individual with expertise. Again, my issue with book lists is not with the lists themselves. I do not care where a booklist came from or how many awards the books on it have won; educators are still responsible for applying their expertise and critical lens to texts. What if we no longer thought about individual texts as diverse or not diverse; instead, viewed texts as existing along a continuum and how individuals from minoritized groups are represented in those texts. 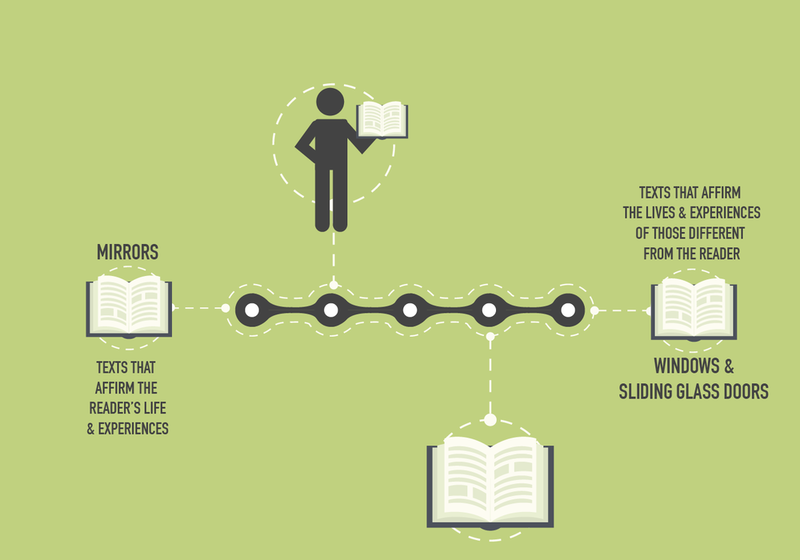 As the reader moves from one end of the the continuum to the other, he moves from texts that affirm his life and experiences toward those that affirm the lives and experiences of those different than the reader. The reader also comes into contact with texts that help to develop his ability to empathize with others. Notice I said develop the ability to empathize. We cannot read one book that features individuals from a minoritized group and state, “I now have empathy for insert group here.” Connecting to Dr. Bishop’s work, the reader moves from texts that serve as mirrors to texts that serve as windows and sliding-glass doors. This approach centers the reader, not the text; because one cannot determine where a text falls on the continuum without first considering the reader. I am intentional about not saying that as the reader moves from one end of the continuum to the other, he is moving from less diverse texts to more diverse texts, because this, too, centers the reader in such a way that it others the narratives of those that are different from the reader. It’s a continuum-not a progression- because students are constantly moving (reading) back and forth along the continuum. Over time, they are able to see the diversity of the collective texts they have read. Our classroom libraries, therefore, must contain a variety of texts, allowing each student to read across his or her continuum. All readers should be able to find texts that affirm their lives and experiences. All readers should be able to find texts that affirm the lives and experiences of others. Those of us who are children’s literature enthusiasts tend to be somewhat idealistic, believing that some book, some story, some poem can speak to each individual child, and that if we have the time and resources, we can find that book and help to change that child’s live, if only for a brief time, and only for a tiny bit. On the other hand, we are realistic enough to know that literature, no matter how powerful, has its limits. It won’t take the homeless off our streets; it won’t feed the starving of the world; it won’t stop people from attacking each other because of our racial differences; it won’t stamp out the scourge of drugs. It could, however, help us to understand each other better by helping to change our attitudes towards difference. When there are enough books available that can act as both mirrors and windows for all our children, they will see that we can celebrate both our differences and our similarities, because together they are what make us all human.